I know it's taken a week but thought it rude not to detail my foray back into a sprint triathlon last weekend. I picked the Rother Valley Sprint triathlon as it was close to home and would not involve staying away. The race took place on Sunday 9th June and it was recommended by the organiser OneStepBeyond that you register on Saturday. 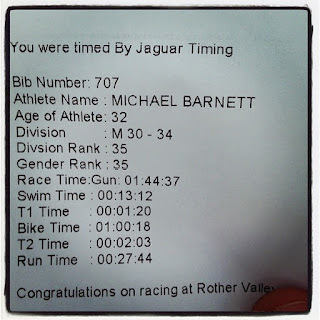 I decided to drive over to Rother Valley on the Saturday so that I could drive the bike course and register. I had heard some bad things about the road quality on the bike course so thought it prudent to check it out before the race got underway. Oh how glad I was I went on a reconnaissance mission pre race. For the first half of the two lap loop the road surface was fine but for the second half it was atrocious. Thankfully the organiser had marked all the potholes and dangerous sections with neon spraypaint. Due to the amount of potholes I decided against using my race wheels as I didn't want to damage them. Instead I decided on using my standard wheels. This left me with a dilemma as the tyres on these wheels aren't in the best of nick. Cue a trip to Planet X to purchase some Vittoria tyres. An unplanned expense. Never mind. Better to be safe than sorry. Another thing I noticed about the bike course was how hilly it was. I really should look more closely at course profiles when I pick races. Hills and me don't really get along as I am not very good at climbing. It isn't easy lugging 15 stone of idiot up a hill along with 1.5 stones of bike and an extra 0.5 stone of liquid in bike bottles. That makes a total of 17 stones being ridden albeit slowly up a hill. Its not really any wonder I say I climb like an elephant on rollerskates. This meant that for the third triathlon on the bounce I had a lot of hills to contend with. Oh joys. I'm glad I recced the course as I knew what I had to contend with. I got up on Sunday and didn't have any nerves to speak of. I know I could complete this distance as I had been training for the Outlaw. The only downside was my start time of 08:34. I set off for Rother Valley and immediately made my way to transition to rack my bike. While in transition I met a fellow twitteree (@aboutwild) who I knew was racing. It was his first triathlon and he looked nervous. He is also doing the Outlaw so it was good to put a face to the name. We had some general banter which seemed to relax him. I'd put on Compeed before the race as a trial to see if they could survive the swim and then be in place for the run. This was to hopefully cure my blister problem. Once my bike was racked, it was time to don my wetsuit in advance of the start. I was expecting the water to be colder than it actually was. 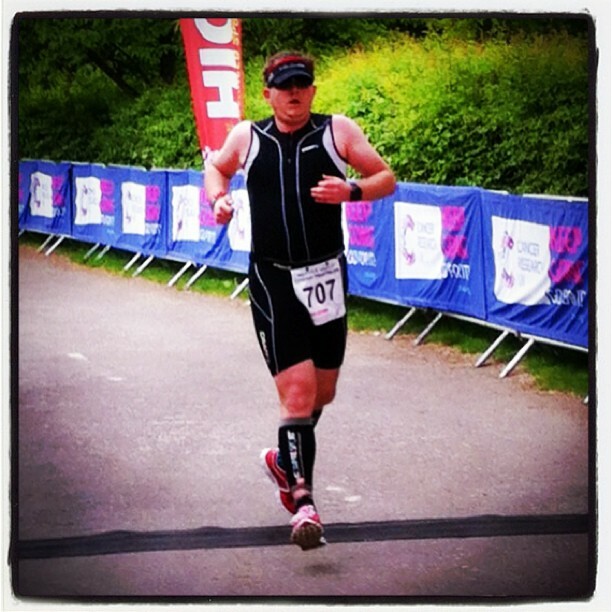 It was stated as being 15 degrees but this was comfortable in my Huub Aerious wetsuit. 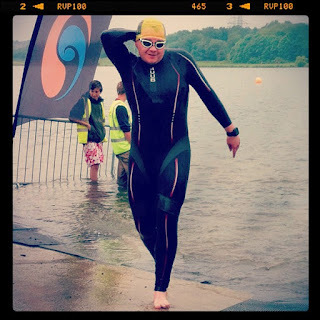 I manoeuvred my way to the front of my wave rather than having to swim past people like I did in Mallorca. The start gun went off and we were underway. I couldn't get clear water on the first straight but after the first turn I noticed a gap to my right. I swam into this and proceeded to swim in my own space. I much prefer this to being in a group. I can't stand locking arms with people. Once in my own space I proceeded to overtake some swimmers who were on my left. At the second turn I think I overtook a couple more. Then we were on the home straight and it was plain sailing for the last leg. There were no other swimmers round me. I exited the water in 13 minutes and 12 seconds. I can live with that. I even smiled on exiting the water and the Mrs caught it on film. One of my Compeed blister plasters came off during the swim. Not a lot I can do about that. My jog to T1 didn't go as planned. I struggled getting my wetsuit off. I forgot it had two bits to undo before you can break the zip. In T1 I dried my feet and put on my socks. I then put on my helmet, glasses, gilet and number belt. I jogged to the mount line. My watch had stopped working at some point in T1 so I have no idea how fast I was going. After I had mounted my bike I set off on the 15 mile route. I cycled out of Rother Valley at an easy pace as I knew there was a hill to contend with as soon as we left the park. I slogged my way up the first hill. This was the steepest part over and done with. The course contained two loops and these were hilly and the second half was riddled with potholes and road damage. I took my time on the first loop to acclimatise with the hills and the damage and decided to push the second loop as I knew what to contend with. I even managed to overtake some people on the second loop. I saw some amazing sights during the bike ride which I thought I would share with you all. One cyclist wearing a TT helmet on a mountain bike although with skinny tyres, seriously what is the point? One cyclist with aerobars on a mountain bike again with skinny tyres but I have to ask why? After completing the second loop it was downhill back to Rother Valley. When I got back to the park there were so many people applauding it was very enjoyable. 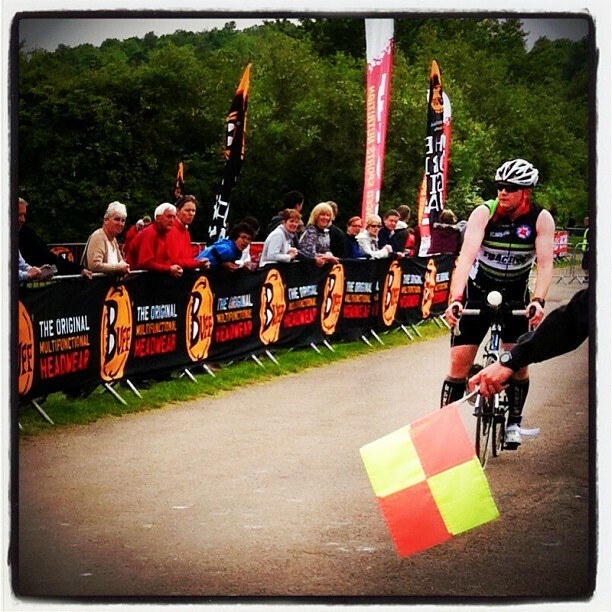 Sometimes (well most of the time) I love the triathlon community as they are so supportive. My time for the bike including the 400m of climbing was one hour and nineteen seconds. It was outside the 55 minutes I had hoped to complete it in but I hadn't comprehended how difficult the road conditions were. I approached the mount/dismount line and managed to lose a shoe as I dismounted. Cue stopping to retrieve it. I then jogged into T2 at some speed. Running on gravel in socks is not very comfortable. 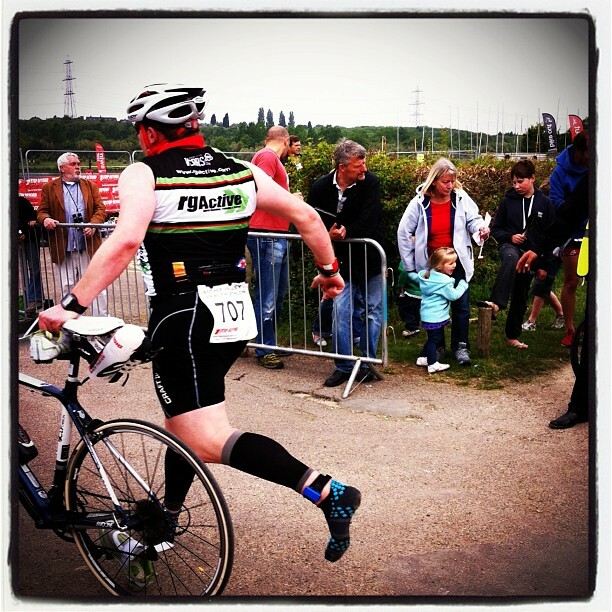 In T2 I quickly racked my bike and put on my trainers. Given the short run I had decided to run in my Skechers trainers as I do run better in them than any other shoe. As I was exiting T2 I had to use the facilities. Given I stopped for a pee I am amazed by my T2 time of 2 minutes and three. I decided before I started that I wanted to run the 5km in under 30 minutes as I had not managed this before in a triathlon. I pushed through the pain barrier and averaged over 11km/h for the just under 5km. I was thrilled that the race organisers had two water stops on the run. It was starting to heat up and I don't think I could have maintained my speed without water. I came home with a run time of 27 minutes and 44 seconds and was elated by this. 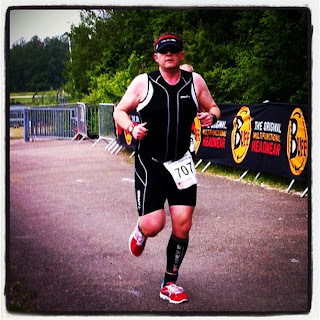 I had gone sub 30 for 5km in a triathlon. I even managed to overtake two people on the run. What's that about? I offered encouragement to these runners as I passed continuing what I started in Mallorca. 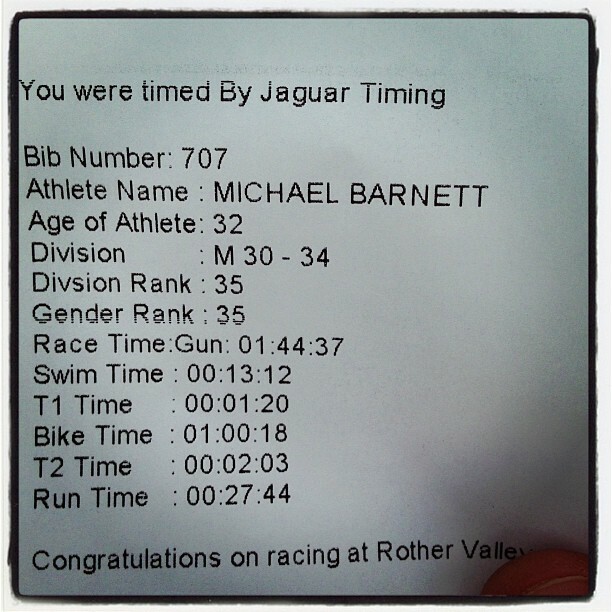 My total time for the triathlon was 01:44:37 which I was really pleased with. 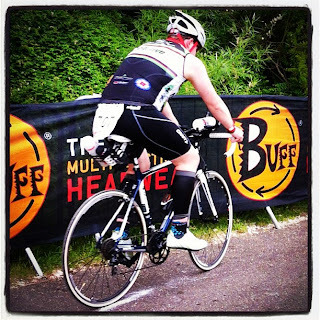 I wonder what I could achieve on a flat course with a 20km bike route rather than a 25km route with 400m of climbing? Could I go under 01:30? I think I could. Now its time for some retrospective comparison. 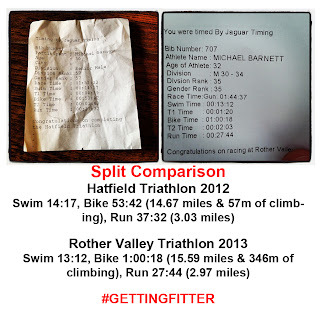 In 2012 I completed a similar distance triathlon in a time of 01:51:03, that triathlon had a shorter bike with no climbing. In comparison my swim time was over a minute quicker, although the bike was slower it had 7 times as much climbing but the run was a full TEN MINUTES QUICKER. This getting fitter lark is good fun. How I have improved in under a year. 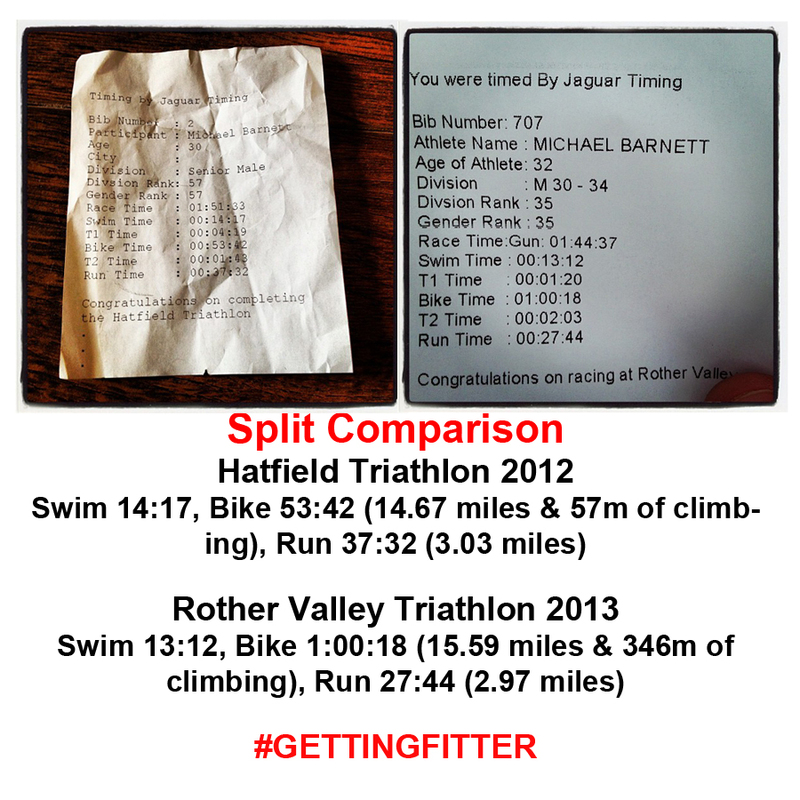 That means I have now completed two of the five different triathlon distances in 2013. 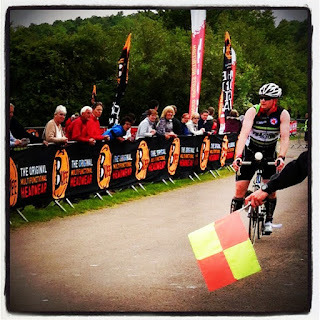 Next up is the iron distance on the 7th July and this will be the biggest challenge I have ever undertaken. Will I race this again. At some point. Banting - Should it be a way of life for everyone?